If you retired, died, or became disabled today, who would own and manage your business tomorrow? Would you want your business interest retained for a family, sold, or liquidated? A Buy-Sell Agreement controls what happens to the company stock upon the occurrence of a triggering event such as the death, retirement, or disability of a shareholder. A Buy-Sell Agreement, which is a contractual agreement between shareholders and their corporation or between a shareholder and the other shareholders of the corporation, is the center of a business continuation plan. A properly funded Buy-Sell Agreement uses life insurance as a funding vehicle to pay the deceased/disabled business owner's family their share of the business interest. Who owns this policy depends on how many business partners you have and what type of corporation you have (S-Corp, C-Corp, LLC, Partnership, Sole-Proprietorship). Setting this up incorrectly can result in additional tax issues, step-up in basis issues and can even result in the need to liquidate the business immediately whether you want to or not. 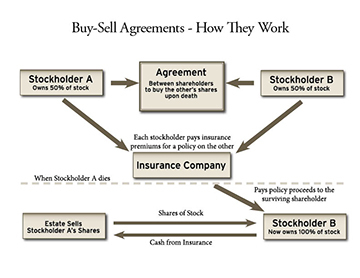 In a Cross Purchase Agreement, each shareholder owns the life insurance on each other shareholder. 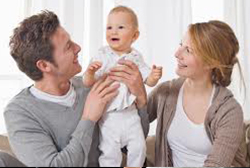 In an Entity Purchase Agreement – the life insurance funding vehicle is owned by corporation. 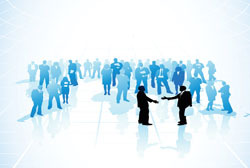 Your business’ value is extremely important when establishing a Buy-Sell Agreement. This value should be reviewed every 3-5 years to ensure your family receives the correct amount for your interest in the business. In today’s changing economy, it is important to review your current Buy-Sell Agreement regularly to ensure it is aligned with the value of your business. Most businesses don’t have enough excess cash in reserve to buy out a shareholder's spouse upon a unfortuneate demise. The life insurance is earmarked to pay (buy out) a deceased business owner’s business interest, with the funds going to the family. Purchasing life insurance can be a relatively inexpensive way to fund your Buy-Sell Agreement. Knowing that the funds are available when the circumstance arises, reduces anxiety about a family's livelihood and guarantees the proper payout for a spouse. Any business owner who hasn't had a proper valuation on their business is leaving the fate of the business and the livelihood of their family to chance. R&R offers free business valuation plans as a complimentary service to any business owner wanting more information about their business and how to ensure it’s longevity, and adequate funds for their family’s well-being. The service is provided by attorney resources R&R contracts with – again at no charge to you. Wisconsin businesses should contact Tom Driscoll for more information about business valuation, Buy-Sell Agreements and estate planning. 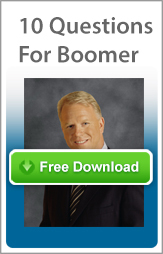 Record setting NFL quarterback Boomer Esiason lost his mother when he was 7 years old. His mother died without life insurance. What a difference life insurance would have made for Boomer's father and sisters. “We were very lucky we had neighbors who could help out and make sure I was being looked after while my dad was at work,” says NFL great Boomer Esiason, who realized the struggles his dad faced after his mother died. "I learned at 7 that no one is guaranteed a tomorrow, so I’d probably look them in the eye and say, "Just imagine if something happened to you and you hadn’t done the planning. The people you leave behind will feel the brunt of your mistakes." Free Download: 10 Questions for Boomer: Learn the connection between football and Life Insurance from Boomer's point of view. For more information about life insurance, estate planning and mortgage protection, contact knowledgebroker Tom Driscoll. As a hockey player myself, I find this story truly amazing. Thank goodness for the foresight Adam's parents had in obtaining whole life insurance. There were no children on the horizon yet for Norm and Sandy Page, but this young couple, in their early 20s, decided to buy whole life insurance policies. Their financial professional explained that whole life insurance builds cash value and that it would help them with their goal of saving for retirement, while also protecting them in case either were to die prematurely. The Pages’ plans changed in an instant when their son, Adam, was born with spina bifida, a malformation of the spinal cord. The couple had good health insurance coverage through their jobs, but there were certain things it didn’t cover like special braces that Adam needed to walk. To pay for these items, the Pages tapped into the cash value that had accumulated in their whole life policies. The money from the policies even allowed Adam to pursue a special dream. He developed a passion for sled hockey, and Norm and Sandy borrowed from the life insurance policies to pay for some of his equipment and training needs. At 15, he became the youngest person to make the U.S. National Sled Hockey Team and at 18, he won gold at the Paralympic Games in Vancouver. As a third-generation dairy farmer, Paul Krzewina’s priority was keeping his 585-acre farm in the family. But doing that meant modernizing, and Paul needed to take out a mortgage to build new barns and buy additional cows. He was concerned, though, that the mortgage would be a burden to his wife, Michele, and their four young children if something were to happen to him. When Paul was diagnosed with a brain tumor three years later, the life insurance proved invaluable. He was able to use a loan against his policy’s cash values to pay his health insurance deductible. In addition, Paul didn’t have to worry about keeping his policy in force because of a provision that waived his premiums in the event of a disability. More on Michele and Paul's story and how life insurance enabled the family to save the farm! 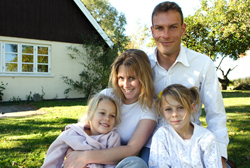 Paul died in 2010, but his dreams for his family are very much alive today. His eldest son, Chad, 28, now runs the farm, and used part of the death benefit to add new barns, including a maternity barn. He plans to expand the operation to 500 cows, from the current 200. Michele works on the farm, too, though in the warmer months her attention is on her ice cream restaurant, The Iceburg. “We couldn’t have done any of these things without the insurance money,” Michele says. Key Man or Key Person Insurance helps to keep your business afloat in the event of the death of a key colleague. If such a tradgey could lead to your company's demise, then you should consider key man insurance. Key man insurance is basically life (or disability) insurance on specific individuals in your company that play a major role in your company's survival. Key Man Insurance is a life or disability policy taken and paid for by the company. The company is the beneficiary. In the event of a death or disability to a mentioned key employee, the company then has the funds to make appropriate business changes to stay in business. It can cover debts, payments to investors or day-to-day expenses for the business. Consider how much knowledge your key individuals have. Are you in the services industry? Key partners such as attorneys or physicians, if gone, would surely affect your business performance. How fast can key employees be replaced? Consider the revenue impact of these individuals being gone, and insure for that coverage to get you back on track. If there is not business continuation plan in place, who will take over the business? If it is a family business, is the spouse willing and able to resume the role? Perhaps they simply want to be bought out and not have anything to do with the busness moving forward. The insurance could take care of the partner buy/sell issues when a tragedy occurs. More on business continuation planning. Banks or financing institutions may require key man insurance coverage to be in place before extending any financing or credit to the company. This ensures the stability and longevity of the business plan and therefore reduces the risk for the lending institution. Keep in mind that younger vs more seasoned key individuals will have different coverage needs. Younger key employees are more likely to be disabled verses dying. Consider disability in addition to life insurance for younger key employees. Key man or key person insurance coverage is usually accomplished with a term life product for 10, 15 or 20 years depending on how many more productive years the key employees have in the businesses. For more information on key man insurance, life insurance or business continutation planning, contact knowledgebroker Tom Driscoll. Held each September, Life Insurance Awareness Month is an industry-wide effort that is coordinated by the nonprofit LIFE Foundation. The campaign was created in response to growing concern about the large number of Americans who lack adequate life insurance protection. Roughly 70 million adult Americans have no life insurance, and 11 million households with children under 18 have not life insurance. To top that off, most of those who dohave life insurance have far less coverage than most financial experts recommend. For more information on life insurance, visit LIFE’s website at www.lifehappens.org. In addition, they have a very cool mosaic going on with "Insure Your Love" that is worth a look! Most mid-life people I know really regret not taking care of their life insurance when they were younger. If they had, they would have saved themselves a lot of money! For more information about life insurance, estate planning, business continuation and annuities, contact knowledgebroker Tom Driscoll. If you died tomorrow, how would your loved ones fare financially? It’s not a pleasant scenario to think about your own death, but not doing so can have serious consequences. You’re Married. Married people share a life with one another, but also share financial obligations. If you died suddenly, would your surviving spouse have enough money to pay for your final expenses and buy time to adjust to a new way of life? Life insurance can help ensure that these financial goals will be met. Life insurance can be considered mortgage protection. Protect your spouse's ability to keep the home that you live in. Life insurance would offer the funds necessary to keep the home and the mortgage intact. You’re Married With Kids. Having kids is the most obvious reason to own life insurance. If you and your income were suddenly gone, would your spouse and kids be okay financially? Life insurance helps replace lost income to help make sure those who depend on you will be provided for, no matter what life throws your way. You’re a Single Parent. As a single parent, you're the caregiver, breadwinner, cook, chauffeur, and so much more. You need to make doubly sure that you have safeguarded your children’s future in case you are no longer there to care for them. Make sure you have enough life insurance and designate who will take care of your children in case the unthinkable were to happen. You’re a Stay-at-Home Parent. Just because you don't bring home a paycheck doesn't mean you don't make contributions to your family that would be expensive to replace. If you were no longer there, could your spouse afford to pay someone to provide the childcare, transportation, cleaning, cooking and other household responsibilities that you handle every day? You’re Approaching Retirement. The kids may be gone and the mortgage paid off, but that doesn't mean Social Security or your savings will necessarily take care of everything that lies ahead. If you died tomorrow, would your financial strategy, without insurance, enable your spouse to maintain the lifestyle that the two of you worked so hard to achieve? You’re a Small Business Owner. Life insurance can help protect your business in a number of ways in the event you, your partner, or a key employee dies prematurely. A buy-sell agreement funded with life insurance allows surviving business owners to buy the company interests of a deceased business owner at a previously agreed-on price. Key-person insurance can provide business owners with the flexibility to hire a replacement when the key employee dies. You can get a general sense of your life insurance needs by going to www.lifehappens.org/lifecalculator and using the online calculator offered by the LIFE Foundation, a nonprofit insurance education group. Or, you could contact me and we can have a quick discussion to help you determine the right coverage for you and your family or your business - products that fit your lifestyle and your budget. If people depend on you financially, (i.e. mortgages, schooling, child or parental care) life insurance is an absolute must, and no one should pay more than they have to. Over the past few years we have become accustomed to spending less and saving more, due to the economy. Even as the economy rebounds, many people continue to look for ways to keep their household budgets in check. Luckily, spending less doesn’t have to mean doing with less, especially when it comes to life insurance coverage. There are ways you can maintain your coverage, but pay less for it. Life insurance is a financial safety net for your loved ones, so it’s critical to maintain that coverage especially with the uncertainty that remains in the economy. However, keeping that coverage doesn’t have to be a financial burden. There are ways to save money on your existing coverage, and I’ve got some tips to help you do just that. You’re healthier. If you have quit smoking, lost a substantial amount of weight or made significant improvements to your health, let your insurance company know. You may be able to qualify for a lower rate on your coverage. Rates are near historic lows. Life insurance rates remain near historic lows. In fact, the cost of basic term life insurance has fallen by nearly 50 percent over the past decade. So if your family’s budget is tight and your health status hasn’t changed much since the time you last purchased coverage, you may want to apply for a new policy. If you do, make sure not to drop your current coverage until the new policy is in force. Circumstances have changed. It is smart to review your policy every year to make sure it’s adequate and up to date. If the kids are out of the house, your mortgage is paid down, you’ve gotten divorced or family members no longer need your financial support, your need for life insurance coverage may have decreased. A smaller face amount policy will likely save you money.